Are we dawning on a new era of internet marketing? Is everything we have come to learn about how to make money online about to become obsolete? 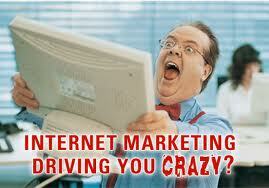 Think about the typical internet marketing “style” we have all been taught over the years. Squeeze pages, long form sales letters, testimonials, pre-sells, “free” and “instant access” buttons. These things have made a lot of people a lot of money, but are they going to last forever? I’m certainly not saying these things are bad or no longer useful, but as far as landing pages, customer acquisition, and the typical internet marketing business model… Are you noticing the crackdown like I am on the way we do things? I have been thinking a lot about where I want to take my internet marketing business in 2011 and over the christmas break I have been going through a bit of a mindset change mostly due to the mentoring and advice I have been receiving from James Schramko and Ed Dale. It seems that the era of quick tricks, loopholes and workarounds may be coming to an end. If you have been involved in internet marketing for more than 2 years you will have noticed some big changes. You will have noticed that the Big G… Google, is not favoring the way we do things. They are slapping our ad campaigns and de-indexing our sites because they see our typical internet marketing tactics as deceiving, and of little value to the rest of the world. You will have witnessed the FTC crackdown on testimonials and how we now need abundant disclaimers in our ad copy and affiliate recommendations. If big corporations are cracking down on the way we do things, Is it time to wake up and change our approach? when I look at successful people making not just 6 figures a year, but 7 figures, I notice they have a more real world corporate oriented approach. Take a look at James Schramko and Mike Filsaime. Interestingly they both have a similar backgrounds as General Managers in executive car dealerships. Mercedes Benz and BMW. They have been required to manage large teams of people, run a real offline business, and turn a profit at the end of the day. They have an incredible set of real world business and management skills that they have applied to online marketing, and have absolutely crushed it quadrupling their previous income in no time. It seems to me that the smart money is moving away from what we know as “internet marketing” and developing sites that look more like the rest of the world. Real businesses. I mean, if almighty Google doesn’t like what we’re doing… doesn’t that say something?